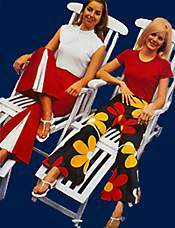 1960s Fashion – Teen Clothing – Let’s get the boring stuff over first. The teen clothing at left and below is how we actually dressed for school in the Sixties. Over the course of the decade, the hemlines would shorten a little, a very little to just above the knee. I graduated from high school in 1968. We had a Dean of Girls who was relentless about skirt length. If you knelt and your skirt didn’t touch the ground, she’d fix that. She’d cut the hem out, making it longer. If that wasn’t sufficient for decency, you were sent home. No pants or shorts allowed in school. And I don’t know what awful thing would have happend to you if you dared to wear jeans. Okay, today that behavior would get her arrested, but the simple truth was that high school in the 1960s was conservative. On Fridays we wore our school colors. Blue skirts, white blouses for girls; blue slacks, white shirts for guys. For social occasions you could wear your skirt length shorter than what was acceptable at school. The dresses at left and right are light and fun. We called these hip huggers. Low slung and worn with a wide belt. They had a slimming effect which made them very popular. Low slung straight legged pants in cotton denim or print. Wide contour belts with big metal buckle. 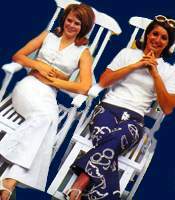 Bell bottom pants are a signature of the 1960s and would last for another decade or so. 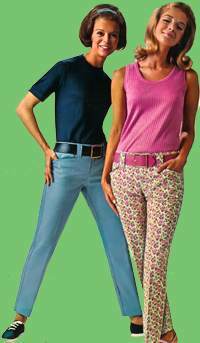 Bell bottoms graced dress and casual pants alike. Yes, we wore jeans, but not nearly as often as today. Where jeans are acceptable just about anyplace in a modern world, in the 1960s, they were worn for only they very most casual activities. You would not, for example, wear jeans to a movie or shopping. All cotton denim cut the slim line way.